Learn how to use features from AT&T Office@Hand. Access our self-help options to set up and use this application to communicate with customers. Summary: How do I manage call flip settings using my AT&T Office@Hand Mobile App? This article will guide you in setting up the Call Flip feature using the AT&T Office@Hand Mobile App. To do this, follow the steps below. • Click here if you are a User or Administrator and want to set up your extension’s Call Flip settings using the AT&T Office@Hand Mobile App. 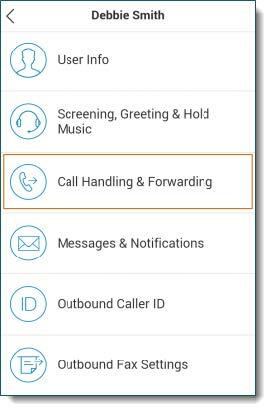 • Click here if you are an Administrator and want to set up the Call Flip settings of another extension using the AT&T Office@Hand Mobile App. 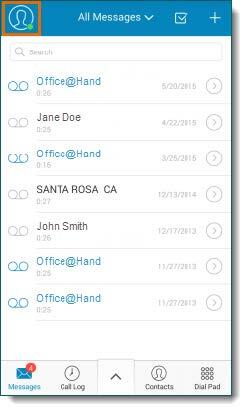 Launch the AT&T Office@Hand Mobile App. Tap Call Handling & Forwarding. You will be able to see the list of forwarding numbers assigned to your extension, with their corresponding Flip number (Quickdial number). You can change the order or Call Flip Number by clicking on the position arrows found on the left side of the Phones/phone numbers in the extension. Tap Save in the Call Flip settings. Tap Save in the Call Handling & Forwarding settings. NOTE: You should log in as an Administrator to change the Call Flip settings of another extension. Select the User you wish to update. In this example, we are selecting Debbie Smith. You will be able to see the list of forwarding numbers assigned to the User’s extension, with their corresponding Flip number (Quickdial number). You can change the order or Call Flip Number by clicking on the position arrows found on the left side of the Phones/phone numbers in the extension. © AT&T Intellectual Property. All rights reserved. AT&T, the AT&T logo and all other AT&T marks contained herein are trademarks of AT&T intellectual property and/or AT&T affiliated companies. All other marks are the property of their respective owners.